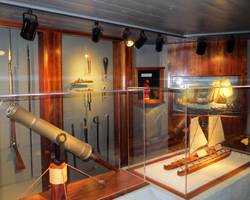 The Army Museum of Hawaii: See it for Free at Fort Derussy in Waikiki. and Valor at Fort DeRussy, Waikiki! The U.S. Army Museum of Hawaii is a lot bigger than I expected. I’m not sure why, because it’s obviously big enough to park a Cobra attack helicopter on the roof and a couple tanks out front. Nevertheless, it seems dwarfed by the surrounding hotels. 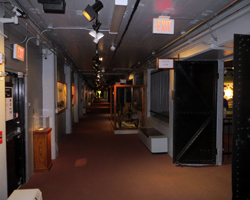 But then again, Battery Randolph (the facility in which the Hawaii Army museum is housed) was purposely built to be unobtrusive to (enemy) observers. When you’re inside the Army Museum of Hawaii, it feels impregnable. If you suffer from claustrophobia, you might want to re-think your plan to visit this attraction. Constructed in 1911 as a first line of defense against attack by sea, the battery is made from steel-reinforced concrete up to 12-feet thick! It’s low-profile, half-buried in sand, made it hard to recognize from the ocean. And it packed a serious punch: being capable of firing 3/4 ton projectiles up to 14 miles from two 14-inch guns mounted on “disappearing” carriages. Targeting solutions were triangulated from the fire control stations at the summit of Diamond Head and Tantalus. When the battery was constructed, a seaborne attack was the only possible threat. 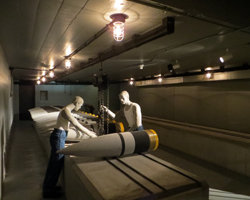 However, with the introduction of airborne warfare, as was experienced during the infamous sneak attack on Pearl Harbor at the beginning of World War II, the battery’s huge guns became obsolete; and they were taken out of service immediately after the war. In 1969, the U.S. Army attempted to demolish Battery Randolph, but it proved too strong for a wrecking ball; and there was no way they were going to attempt explosives in the heart of Waikiki! 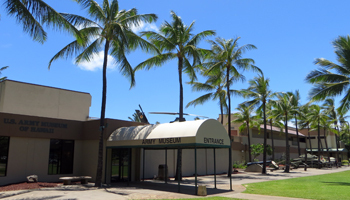 Thus, in 1976, the facility was re-purposed as the U.S. Army Museum of Hawaii. Today, the Army Museum of Hawaii welcomes Waikiki visitors as a fun and free Hawaii activity that’s definitely worth the cost of admission! I’ve seen a handful of war museums, and this was probably the most interesting to me. I don’t know if that’s because of the artifacts on display or just the fact that I was inside a real bunker rather than some modern museum. Either way, it was impressive. 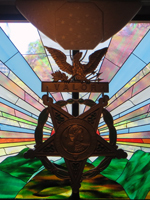 Exhibits include the outdoor tanks, helicopter, and guns already mentioned, plus indoor exhibits such as a gallery of heroes, Hawaiian warfare, World War II, the Korean and Vietnam wars, and more! 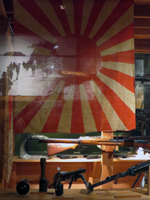 When I was there, the Army Museum of Hawaii also featured a special exhibit about the heroic 442nd Infantry Regiment, which consisted primarily of Japanese Americans and was possibly the most decorated regiment in U.S. Army history! I don’t know if this exhibit is permanent or not. In addition to the museum, Fort DeRussy also offers a great park for barbecues and beach volleyball – all fronting one of the most-popular stretches of Waikiki Beach! You don’t need a military ID to have a good time here. Just bring your sunscreen, swimsuit, and your enthusiasm for Hawaii fun activities!